No shelter combines reliability with convenience like Shelter Logic's Peak Style Portable Garage Canopies. 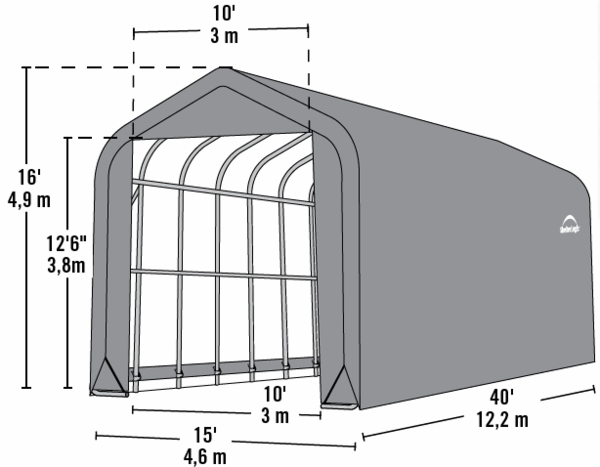 This 14' x 40' x 16' Canopy features an eleven-rib frame made of 2 3/8" diameter steel. That steel is tempered with a 13 step Rhino Shield process and bonded with Dupont's thermoset baked on powder coat finish: it's built to last. 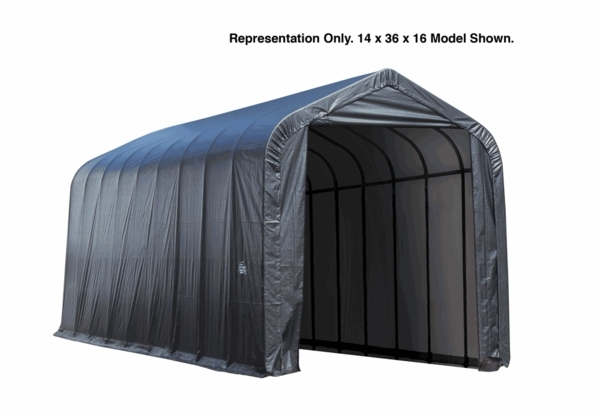 The garage cover is a single piece of 9 oz., heat bonded, triple layered polyethylene treated with anti-aging, anti-fungal, and fade-blocking agents. It's waterproof and tear resistant. This item includes a 1 year warranty. I need a replacement for the front panel and back panel for a 14x40x14 P4 Tan/W Peak Style Bolt Garage. I need a replacement canopy for a 14x40x16 part #95843. We do not supply this replacement cover, though it may be available from Shelter Logic.